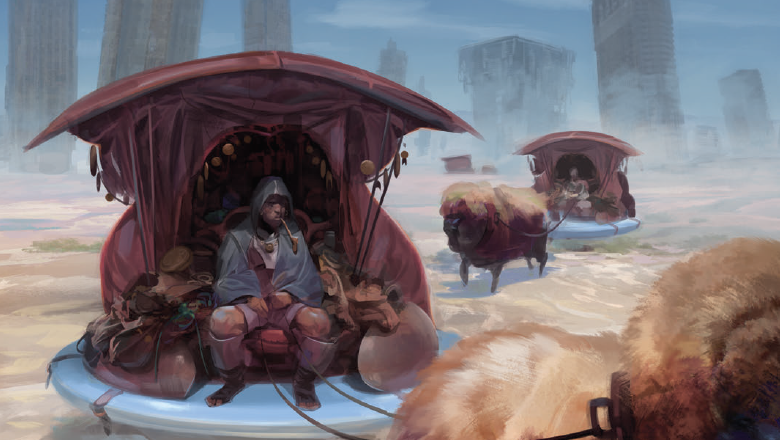 "Numenera is a perfect example of what Monte Cook does best--create fascinating settings while stretching the boundaries of what RPGs can do." 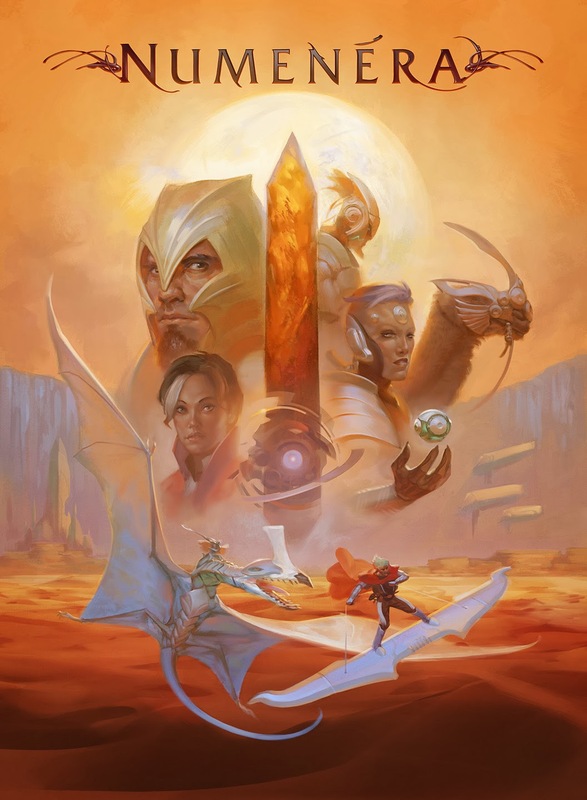 Earlier in the year, gaming legend Monte Cook decided to post a $20,000 Kickstarter to publish a new roleplaying game he called Numenera. It hit goal within hours and closed at a stunning half-a-million dollars. Why? Monte Cook has been a trusted name for quality and innovation since the turn of the century and when he says he's creating a new RPG, you can bet the industry will be listening. Roleplaying games are tabletop games where players work together to create a story, similar to the way improvisational actors create a story on stage, or friends tell campfire stories. One player, often called a Gamemaster (GM), Storyteller (ST), or Dungeonmaster (DM), plays the part of the writer/director/producer. Unlike a novel, movie or play, though, the characters are created by each individual player instead of the writer. A GM creates the world for the players to interact in, but the players control their own actions and reactions. Roleplaying games exist for any and every genre--horror, fantasy, science fiction, mystery, pulp, secret agent, alternate history, romance, superheroes, etc. Any movie, TV show, or novel you've seen or read can be the setting for a roleplaying game; in fact, TV shows (Stargate SG-1, Firefly), movies (Star Wars), comic books (Marvel, DC), novels (The Wheel of Time, Game of Thrones) and even computer roleplaying games (Warcraft) have all inspired their own tabletop RPGs. The GM acts as a rules moderator. They also play the parts of supporting cast characters (Non-Player Characters, or NPCs), describe settings, grant clues, and putt interesting plot twists in front of the players to make the game as fun and interesting as possible. Players react to these plot twists and clues based on their own motivations and their interactions with other players. Though players may accomplish goals, like tracking down a killer or solving the mystery of the Lost Ark of the Covenant, there is no winning or losing in roleplaying games. A game is a win if everyone has a great time. Numenera is a science fantasy RPG inspired by Arthur C. Clarke's Third Law: "Any sufficiently advanced technology is indistinguishable from magic." Numenera takes us far enough into the future (a billion years or so) that the Earth is so different, with technology so bizarre and beyond our current understanding, that it feels like magic. Eight major civilizations have risen and fallen, including extraterrestrial and extradimensional incursions, and the world is coming out of a Dark Ages. Bizarre creatures and inscrutable technologies cover the planet, waiting to be discovered; floating towers, machines plugged into the molten core of the planet, strange vehicles, mutants, satellites, and a ubiquitous haze of nanobots that fills the atmosphere. These objects are scavenged by the current generation like medieval farmers using the stones of abandoned Roman aqueducts to make their homes. The word Numenera comes from "numinous", meaning something that has a strong religious or spiritual quality; indicating or suggesting the presence of a divinity. The people of Earth worship this technology, often using it for purposes never intended by their creators.